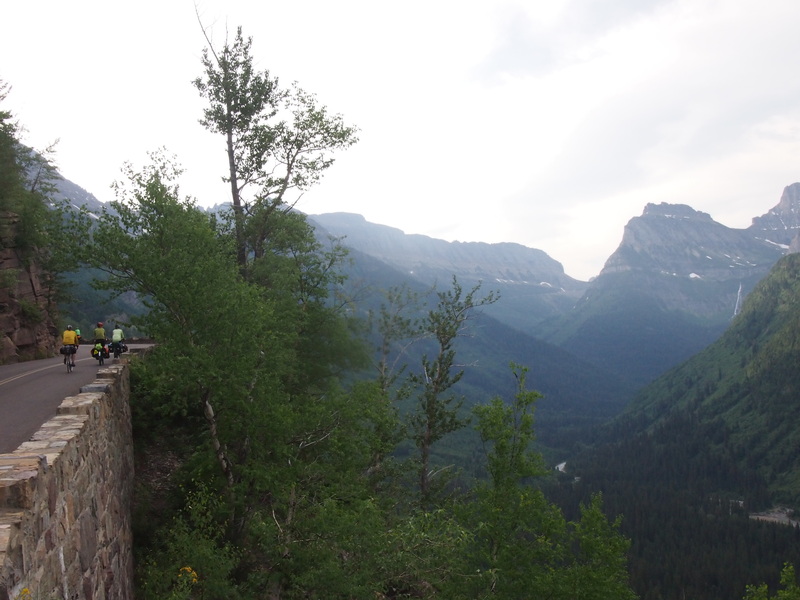 Day 16, Sprague Creek Campground, Glacier National Park to St. Mary’s Campground, Glacier National Park: 40.2 miles, 3,958 ft elevation gain, 9.5 mph average speed. Literal and figurative ups and downs today. We broke a new record for leaving our campsite again, mostly because we knew Clive would be waiting for us at his lodge a mile up the road. 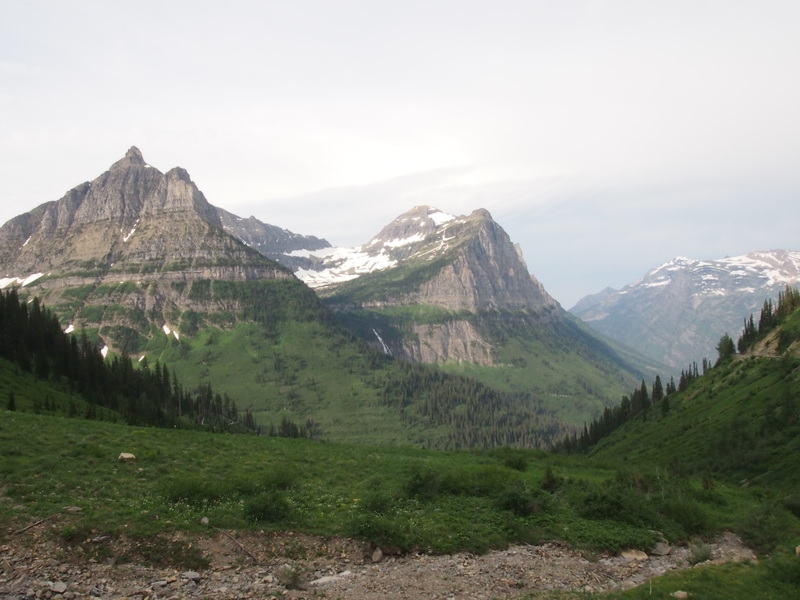 We decided that we’d meet Clive at 5:45a partially because I was a little nervous about making it to Logan Pass by our 11a deadline, and partially because we heard the traffic gets worse and worse throughout the day and the cliffs are steep. Traffic + steep cliffs + tourists looking around while driving = potential badness. Dan and Gina were staying at our campsite, so we all left to meet Clive at 5:35a. 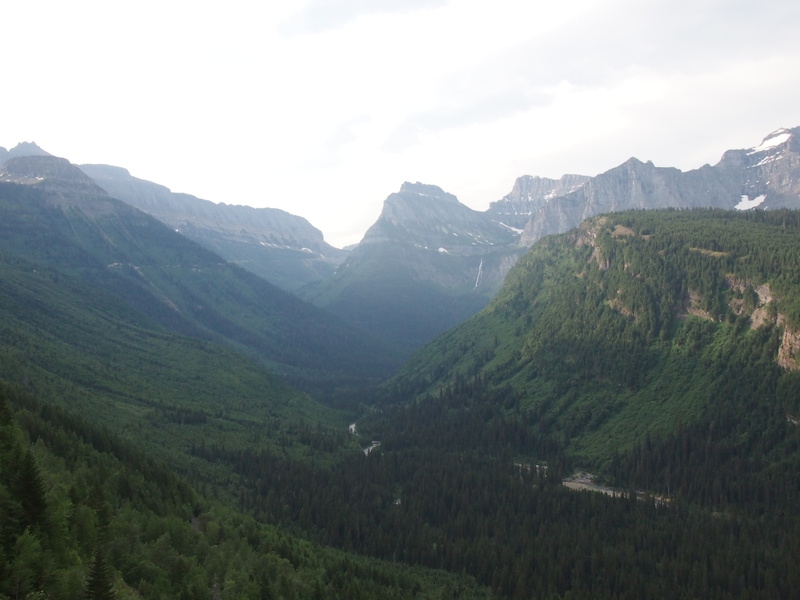 Going to the Sun Road was spectacular. We started the day with 10 miles of very gentle climbing, then began a much steeper, but perfectly graded eleven-mile ascent. 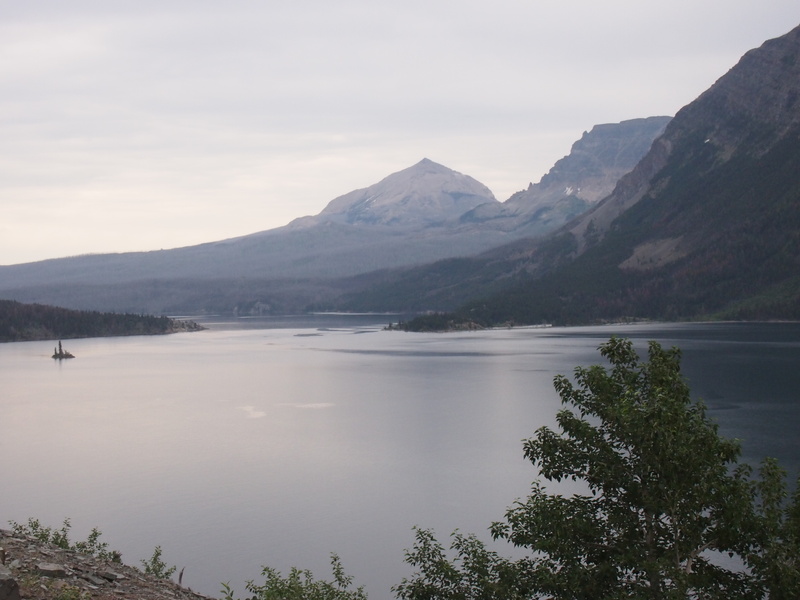 When the park service built the road in the 1930s, they aimed to create a road that traced the side of a mountain at a steady grade and provided spectacular views. In our opinion, they succeeded! The views got more and more spectacular as we ascended. There were endless, picture-perfect vistas, gorgeous waterfalls, etc. on the way up. Pictures won’t do it justice, but they will do a much better job than I at conveying the wonder. When we reached the top, we ate a bunch of food, drank a bunch of water, and gawked at the incredible views. After about an hour we headed down and hit a roadwork zone where they were only allowing use of one lane and alternating west- and east-bound traffic. The flagger told us that bicycles had to go last, but invited us to hang out in the traffic pull-off where he was standing. We waited there, baking in the heat, for no less than an hour before we were allowed to follow the cars down. The cars were moving at a snail’s pace, so we really didn’t need to go last. Plus, at this point, we already knew that Ted’s rim had a crack in it and he had a feeling that using his rear brake would exacerbate the problem (plus it made a terrible noise because the outside rim was bulging out), so he was relying entirely on his front brake. 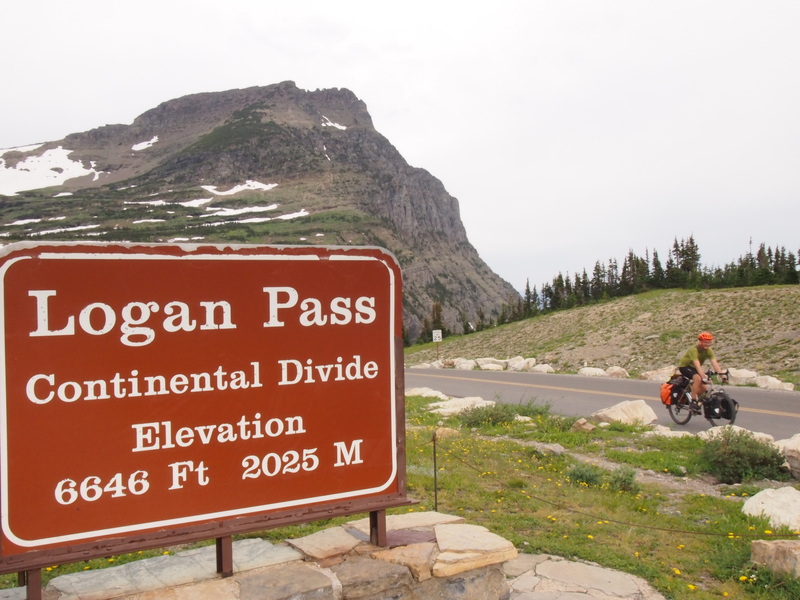 He planned to fly down the descent, rarely using his brakes, but because of the roadwork traffic, he had to brake constantly on the six-percent grade and was sometimes forced to supplement with the rear brake. This ended badly. By using the rear brake and compressing the rim, he made the crack worse and ended up getting a flat from the jagged, sharp metal crack. Because of the roadwork and the general narrowness of the road, there was no place to pull off and he had to walk his heavy bike down for 20 minutes to get to a pull-off where I was waiting. Poor Ted. This hurt his shins pretty badly because he was working so hard to keep his bike stable and because bike shoes are not made for walking. We pulled his tire off to look at the crack and saw that it had nearly doubled in length since last night. Then it started raining for the first time on our trip. Comedy of errors. We applied a few layers of duct tape to the crack in hopes that it would prevent another flat, changed the tube, and headed down the rest of the hill. Unfortunately, although our map’s elevation profile made it look like we’d be descending all the way to St. Mary’s, we had rolling hills instead. We were happy to get to the campground with bikes and legs (barely) intact. After setting up camp and taking free warm showers (all for $5 per person per night; take note, Montana Bike Hostel), we headed into what we believed was a town to find WiFi and get a new wheel shipped to us. Unfortunately, it was not really a town; it took us a long time to find WiFi and by the time we did, Velocity (Ted’s wheel manufacturer) was closed. Defeated, we headed back to the campsite, made dinner, and plotted our next move. Our trail friends picked up s’mores ingredients and beer and we had a “No s’more mountains” campfire (name credit: Dan and Gina) to celebrate making it through the North Cascades and Logan Pass. We met another bike tourist, Dave, who quit his job in Baltimore a few months ago and is making a giant loop around America. Very cool. When Dan and Gina came back to the campsite, Gina was kind enough to let us use her phone (she has Verizon), so we were able to do some research, make a few calls and come up with a plan for Ted’s wheel situation. 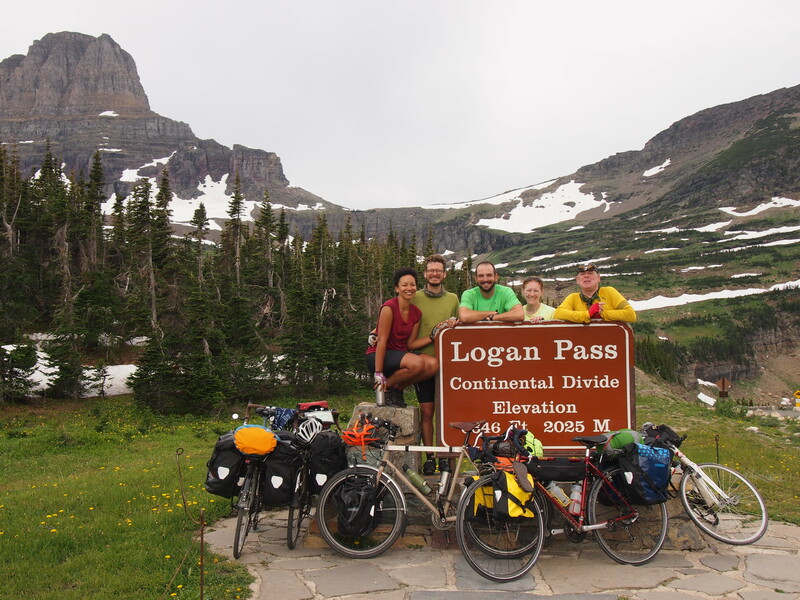 We don’t feel 100 percent comfortable riding very far with this wheel, but feel fairly confident we can make it 21 miles to Many Glacier, a gorgeous region of the park that we were planning to go to anyway. We plan to have the wheel shipped to the hotel out there so that, even if we’re stuck, we’re stuck in what many people have told us is the most beautiful place on earth. Depending on what happens when we contact Velocity tomorrow, we might have lots of time to test that assertion!